In the future, Doctor Azuma invented a new kind of robot to serve humans ... but a lab accident turns his greatest creation into the rogue Braiking Boss, an evil monster android who will use his robot army to destroy all humans! In a desperate move to prevent the end of mankind, the doctor's son, Tetsuya, transforms himself into the cyborg known as Casshern (or Casshan, depending on who was doing the English localization that day). To help his son, Dr. Azuma builds the robot dog Friender, who can transform into a motorcycle, a submarine, a tank, and other vehicles. Thus the 1973 anime series Neo-Human Casshern is born, to fight for everlasting peace! Hmm ... super-powered robot-man with a robot-dog pet that turns into vehicles, as he fights an evil criminal gang of robots bent on taking over the world? Yes, the original Casshern series was a strong influence on Capcom's Mega Man, and Casshan/Casshern was also a character in the recent fighting game, Tatsunoko vs. Capcom. A popular influence in Japan, Neo Human Casshern is largely unknown to U.S. audiences. Taking a page out of the playbook of U.S. comic books, Casshern Sins reinvents the characters of the original series with a lot more emo, a lot more bleakness, and a lot more pointless fighting. In the Sins universe, Casshern is now a bad guy - maybe. It's hard to tell at first, because Casshern is suffering from amnesia, and all he knows is that some rusty robots want to kill him. Telling you more would risk spoilers, and the only reason to watch this thing, anyway, is for the big reveal that's not that big of a reveal. Unfortunately, if you're looking for gonzo robot fights with strange weapons and scenery-spanning action, you won't see it in Casshern Sins. Not since Dragonball have landscapes looked so bleak and so repetitive. Despite being robots in the far future, most of the fighting is sword-play, and pretty unimaginative play at that. It's a strange mix of Astro-Boy clunker-bots fighting Gatchaman-style androids, and the directing doesn't do it any favors. Clunky bots swing and miss; androids do slow gymnastics of spinning in the air; lather, rinse, repeat. 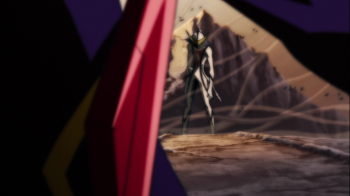 Casshern has a very limited repertoire of martial-artist moves, and his allies use the same ones. The retro-styling of the characters does not make the transition well. The original 1970s versions of these characters were tailor-made for cheap television animation; upgrading them to two-tone, computer-controlled shading only highlights their flaws. And the low frame rate on most of the sequences doesn't help at all. The animators spend a lot of freaking screen time on a little girl with saccharine levels of cuteness, until you almost wish something bad would happen to her ... just so something might happen, already. Making cute cartoon characters talk a lot, then bleed a little, then talk some more, just bores an audience who would rather see action and adventure. No one who loved the original series wants to sit through all this emo philosophizing, much less to watch their hero made into a bad guy just to satisfy a misguided reinvention. And lovers of anime aren't going to see any new ground broken here. Fist of the North Star has much better visuals of a post-apocalypse world, not to mention much, much better martial arts sequences. Ergo Proxy presents mad robots and impending doom with tighter plotting, faster pacing, and better directing, and Wolf's Rain let the audience watch humanity's decline with more fantasy, more mystery, and more empathy. And all three of those series took less than 12 hours to tell their stories. Bottom Line: Much like Getter Robo Armageddon - another reinvention of a beloved boy's anime into something dark, grim and gritty - Casshern Sins bends over backwards with the weight of its own gravitas ... and the end result pleases no one. Recommendation: Casshern Sins could work in small doses in the rotation in an anime club, bracketing lighter fare ... but only the most diehard fans are going to want to sit through the entire thing. Funimation has the complete Casshern Sins series available in a single DVD boxed set. After seeking refuge in the Earth's last zoo, Norman Rafferty is cursed by the phoenix to walk the ecologically-destroyed landscape that is the legacy of the dead human race.